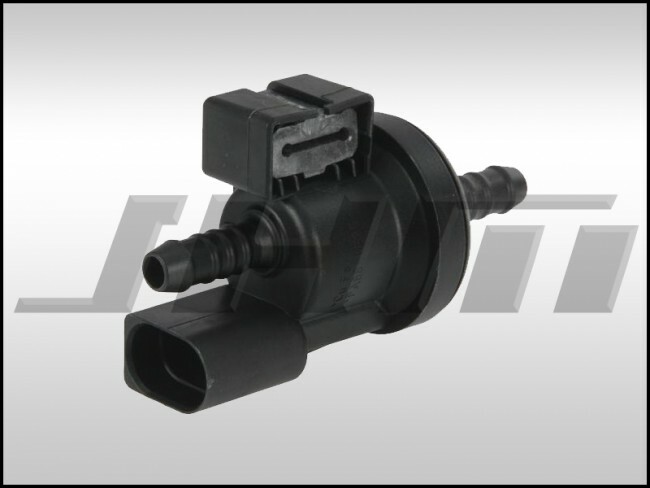 This is an OEM EVAP purge solenoid. These can fail or get plugged and give EVAP system flow codes. On some applications, this part is located above the stock airbox, closer to the outer firewall. On the B7-RS4, it is located behind the intake manifold by the oil filter housing. On the B7-A4 2.0T, it is located near the intake manifold, close to the coolant expansion tank. If your EVAP Purge solenoid is malfunctioning because is is clogged or damaged, it's possible that one of the codes you get is 001109 - EVAP System, P0455 - 001 - Large Leak Detected - MIL ON.